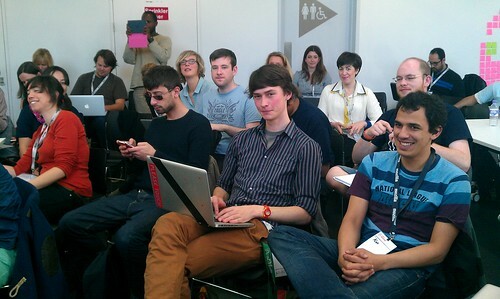 Sunday at the Mozilla Festival in London, I facilitated a group session on curating and repackaging citizen video for the news. This blog post was written with @SarahMarshall3, technology editor at Journalism.co.uk. Thanks to Chris Marstall, Marta Cooper, Dan Schultz, Laurian Gridinoc, Renata Avila, Jesse Shapins, Sam Carlisle, Richard Hering, Alex Boyd, Elger van der Wel, Janet Gunter, and Philo van Kemenade for fantastic contributions to the conversation. Double thanks to Sylwia Presley for work beyond the call of duty to set up our space and make sure we had all the resources we needed for a great meeting. The video, which appears to be footage taken by a classmate, shows a Russian girl kicking her English language teacher in the crotch after he yells at her and strikes her for failing to read from the board. Apparently sparking substantial conversation about Russian education, the video spread rapidly online. I’m still surprised it wasn’t turned into an animated gif. What would it take for a newsroom to make sense of this Russian video for an English speaking audience? First, journalists would have to find the video. In breaking news stories like Hurricane Sandy, people were uploading thousands of videos, and a good newsroom would have to work hard to find and aggregate good ones. Newsrooms would have to verify the video: is it a hoax or not? A good news report would also subtitle and translate any spoken parts. Finally, the video needs context. Is this kind of behaviour typical in Russian schools? What policies or social trends help us interpret this incident? FInally, publishing a good story will involve repackaging the video and its context into a format that works for its audience. All of these steps are critical when working with citizen video. Even though the Russian video appeared in mainstream media, it doesn’t appear to have been verified and may be a PR stunt for a new Russian television station. News outlets also haven’t added context. As a result, the video remains just a video rather than a story. Chris Marstall started out by describing Snap, a map of Instagram posts used by the Boston Globe to download and save every instagram picture taken in the city of Boston. Once Chris finds a photo, he asks its creator for permission via the comments. Instagram doesn’t offer a way for you to contact the photographer, and so the Globe has to contact people personally. It’s important to play by the social conventions of the platform you’re drawing from. Chris follows the person, likes their photo, comments on their image, and only then asks to use it (Sarah has written a longer post about Snap on Journalism.co.uk). Mapping is a popular way to filter and deliver citizen reports. During Hurricane Sandy, the citizen media verification service Storyful worked together with YouTube and Google to make a crisis map of Sandy videos. At the Center for Civic Media, Charlie De Tar developed the SandyStream Map of Sandy livestreams. Patrick Meier has compiled an excellent set of case studies for crowdsourced information verification( pdf: “Verifying Crowdsourced Social Media Reports for Live Crisis Mapping: An Introduction to Information Forensics.”) His blog at irevolution.net includes numerous case studies like the use of Skype for cooperative verification in Kyrgyzstan. Standby Task Force offers volunteer verification as part of their humanitarian response service. Storyful has written extensively about their verification process. Read more in this blog post or the Storyful case study in this excellent Nieman Report on Truth in the Age of Social Media. Peepol.tv, a Knight News Challenge winner which aims to aggregate and find livestream content. The project is very early stage, so check out their site for more information on collaborating. Jesse Shapins of Zeega introduced us to their fanastic media archival, remixing and sharing platform. Check out their site for more examples. The Zeega team also facilitated a conversation with PopcornMaker and people from Tribeca on a Web Documentary Manifesto at the festival. We also discussed PopcornMaker, a tool for remixing and annotating video on the web which was launched at the Mozilla Festival. Renata, of Global Voices, asks if there is a tool to curate video quickly with low bandwidth? People in countries with limited Internet face two problems: it takes forever to download videos to edit them and then forever to upload their final projects. Laurian points to Kaltura, which carries out editing on the server. Nathan suggested that someone design an app which allows community members to select just the important part of a video, which is then chopped into smaller pieces that someone with limited bandwidth could download and edit. Laurian Gridinoc points us to Cinemetrics, a beautiful automated technology for quickly sifting through hours of video to find scenes and motion. Philo van Kemenade tells us about his Weporter project for filtering citizen video. It shows users a large number of films and invites them to hover their mouse of the interest. Weporter may make it possible for crowds to collaboratively process far more video than any single individual looking at one video. Next, Sam Carlisle explains Sukey, an app for sharing and aggregating information about demonstrations. Sam is especially interested in developing workflows that allow humans and bots to work together. He describes IRC bots that journalists use to aggregate and verify media coming in from social media. With a simple command, those bots can be told to amplify verified citizen video out to a variety of channels. Sam then tells us about human.io, a mobile phone peer crowdsource platform. He’s using human.io to “re-imagine the journey of information,” inviting demonstration participants to work together to filter information in real time. A participant from visionOntv talks about the cartoons they made to inform citizen media producers about how to shoot citizen video with phones, cameras, and camcorders. We also discussed PopcornMaker Templates. Alex Boyd asks if there’s a way to automate verification. Nathan talked about common video verification techniques and suggests a simple verification checklist dashboard which uses publicly available tools: enter basic information about a video, and the dashboard will pull out lighting, weather, and street view data to help journalists evaluatethe video and triangulate details. Elger van der Wel asks about tools like Hash Gordon which can filter and embed curated collections of citizen video. Nathan points to Zeega’s Japan Digital Archive. A journalist from Al Jazeera talks about documentary film-making and her preference for having her teams shoot as much footage as possible. Often for her, it’s easier to show opposing viewpoints than it is to actually verify the contents of a video. Nathan points to another project at Al Jazeera, The Stream, which is a TV show where social media sets the agenda. A similar example is Huffington Post Live, which uses Google Hangouts to bring in commentators via the Internet. The conversation moves to new kinds of stories made possible with citizen video. Nathan discusses “How National Geographic Used Cowbird Storytelling Tool to Tell a Reservation’s Whole Story” and the web documentary 18 Days in Egypt. In the latter project, journalists aren’t interpreting breaking news for a distant audience. Instead, the people who experience a story are telling the story to each other using their own media. Ivan Sigal of Global Voices has posted an awesome syllabus new directions in visual storytelling. The session on curating and repackaging video was an awesome collaboration. Our group was able to come up with an amazing set of needs, ideas, and technologies. If you’re interested in carrying forward the conversation, leave a note in the comments. You can also reach me and Ethan on twitter at @EthanZ and @natematias. We’ll also post further updates to the Civic Media blog here at civic.mit.edu.